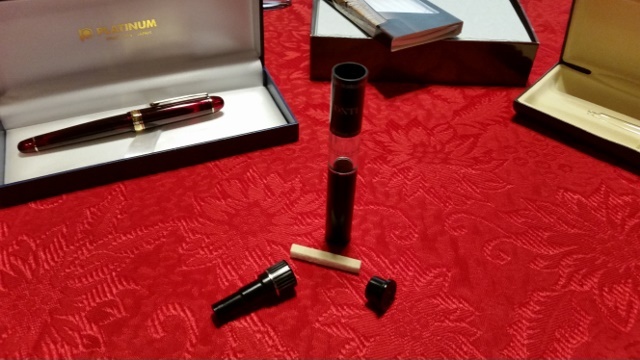 We had a great Christmas so far and were graced with some nice fountain pen kit. 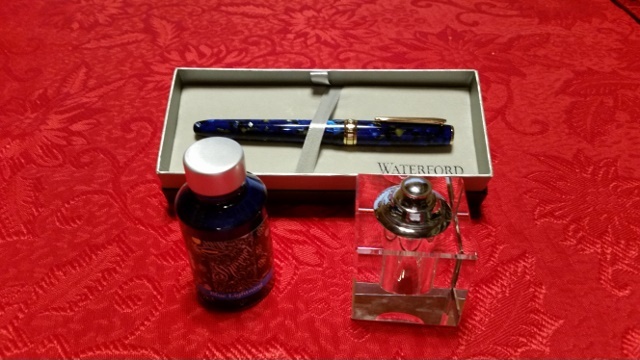 Diamine Blue Lightning shimmering ink, Waterford Celestial fountain pen and the Laban square crystal inkwell. The pen looks better in person than in print or online. It screws to open/close and friction fits to post. ML got a medium steel nib. The ink is amazing. It dries to a beautiful glittering color. 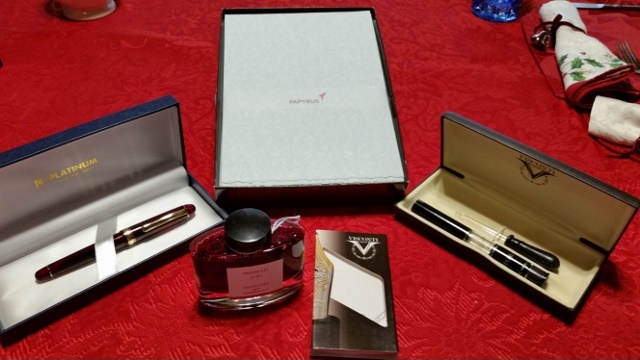 I recieved a Platinum 3776 Century Bourgogne fountain pen, Papyrus deckle edged stationary, Visconti traveling inkpot, Visconti blotting paper and a bottle of Pilot Iroshizuku Momiji (autumn leaves) ink. 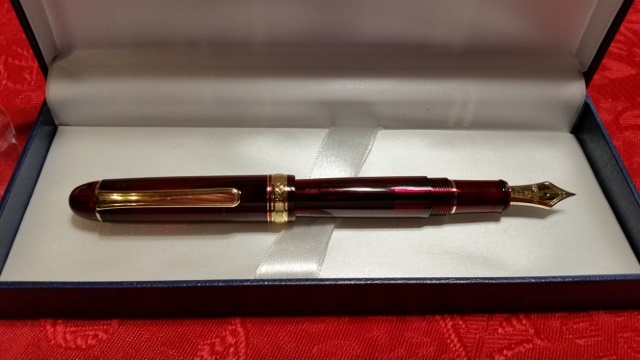 The pen is a beautiful deep translucent burgundy color with a 14kt extra fine nib. It too screws to open/close and friction fits to post. It rights very nicely. I am a lefty so the extra fine nib helps prevent smearing. The inkpot holds ink in the clear section. The lid conceals a little "sponge" for cleaning up the nib area. The inside of the inkpot has a rubbery material. You insert your pen and the rubber grips and seals. Invert the pot and turn your converter or piston to fill. My wife has two specialized inkwells from TWSBI. They are specific to a TWSBI model pen. 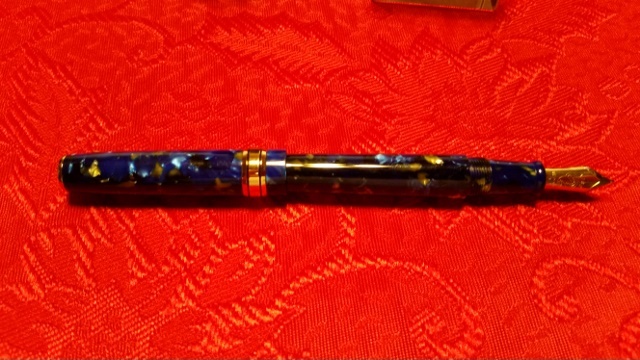 The Visconti appears to be universal as long as the pen fits into the opening. I am looking forward to using my new pen gear. Beautiful, all around, Phil. The pens are beauties and Mary Lou's Laban ink well is striking. How airtight does the ink well seal? I always wonder about evaporation in those. The lid is a snug friction fit but it is not at all airtight. I bought the shimmer ink expressly for this Laban inkwell. I thought it would look striking in there. But the ink needs to be "gently shaken" prior to loading a pen. You can not shake the Laban inkwell if it has ink in it. So some other color will call the Laban home. Thanks, Phil. 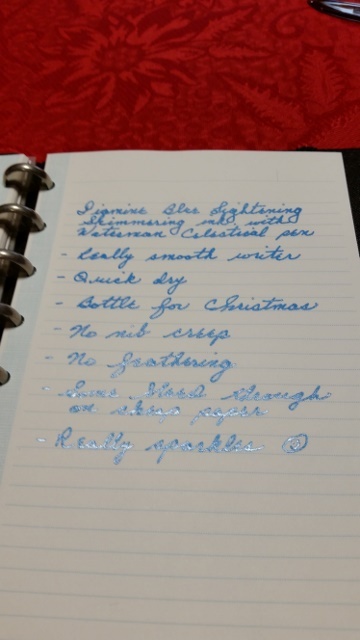 I bought myself the Diamine Shimmering Inks Brandy Dazzle but have not had a chance to give it a try. That's a great system you've got there, Phil; you and your wife giving each other fountain pens. Gorgeous gifts; I even enjoyed just looking at them. That Visconti inkpot is a clever idea. 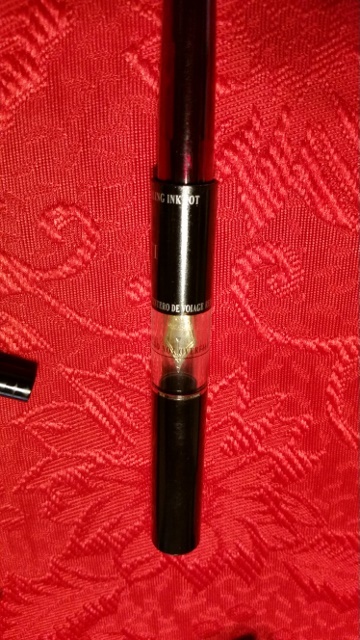 Does your wife have the "TWSBI Diamond 50 Ink Bottle"? Even though it's designed for TWSBI pens, I believe it can accept any other type too. "Tomorrow belongs to those who can hear it coming. - D.Bowie"
She does have the diamond 50. It accepts international sized converters. Really nice pens and great Christmas presents.